It seems to be a recurrent theme in this house. DOORS. Good thing I say, they are a very handy thing stopping large amounts of draught from wandering uninvited around the house. If they are too do such an important job then they might as well be intersting to look at. These disconnected wandering thoughts are the authors own. So the back doors. 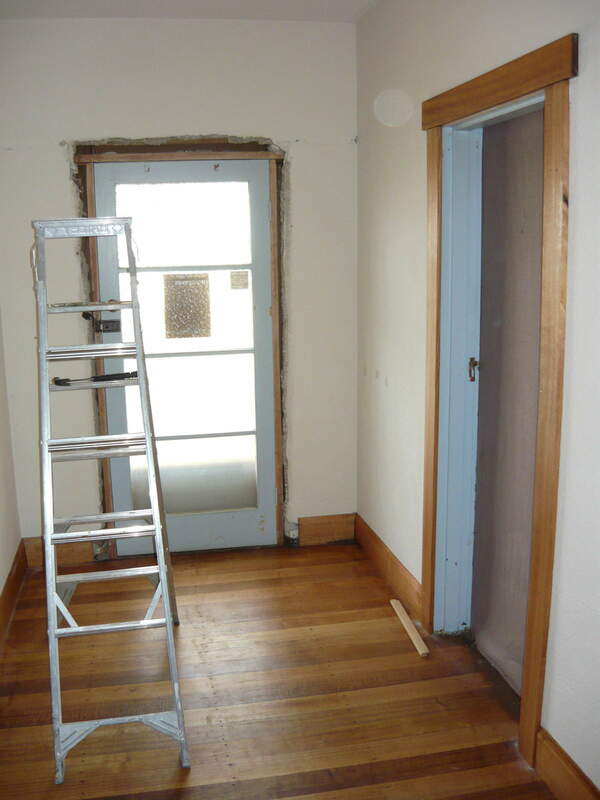 When we were building the dining room we knew we wanted some sort of french doors but had to put a single door in with a temporary sheet of ply as an interim measure as winter was coming. A lovely look as you can see. In the meantime Andy the builder was asking us to get the doors so that he could build the right size frame. 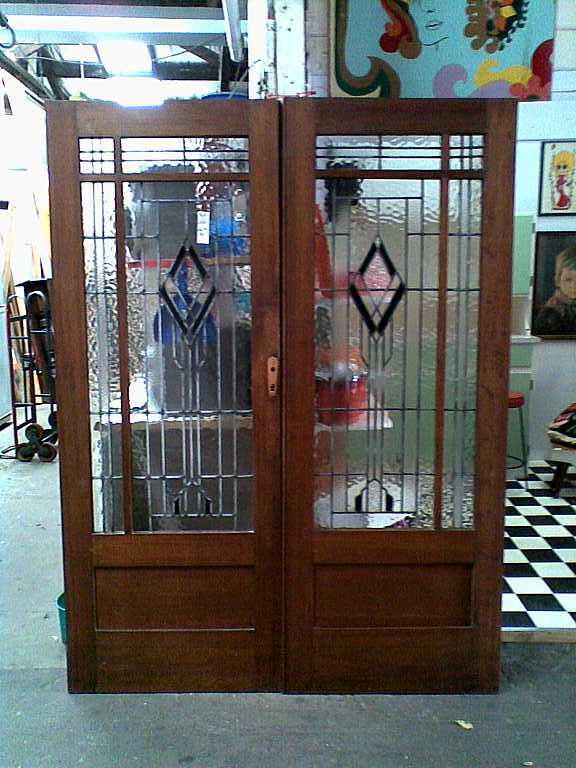 A visit to see George at Launceston Salvage Co, ended up with us being the second owners of a pair of Art Deco leadlight doors built in 1939. 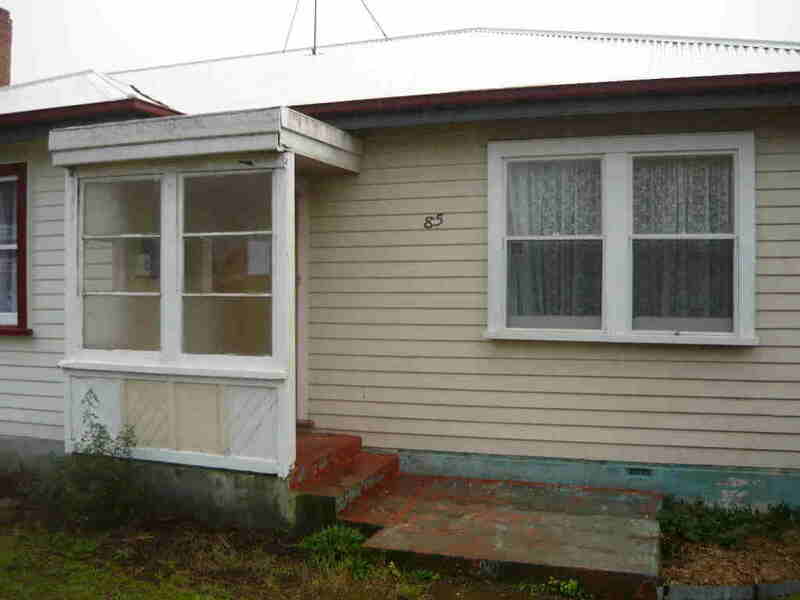 They had been stored under the original house for 15 years and were in great condition. We brought them home, leaned up against the wall in the kitchen and there they stayed for the next 4 months. 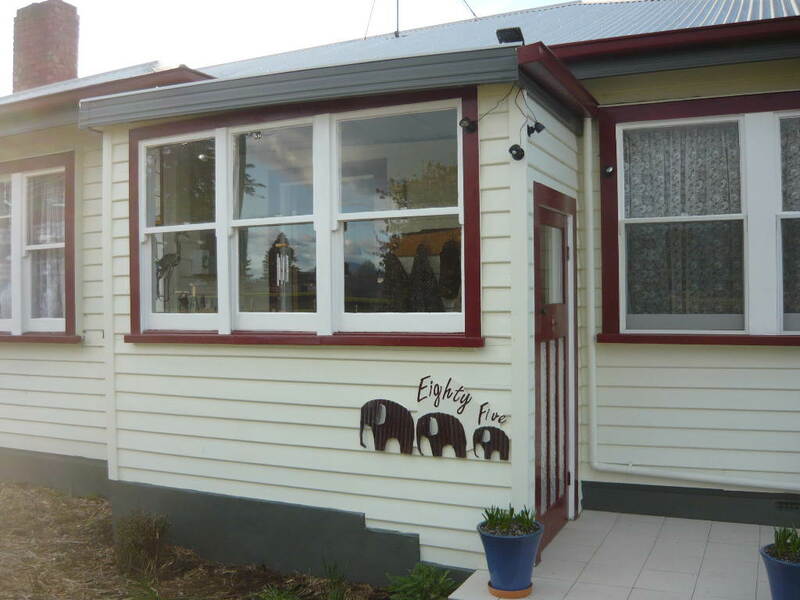 We had to get a frame custom built that cost more than the doors and door furniture suitable for an outside door. There was no furniture on them when we bought them. The months go by and quite rightly Andy does not want to fit them in until all the building on the extension is finished just in case they become damaged. Finally the doors are in!! Finally the day came when they could take pride of place instead of the grotty old core door and the painting outside was also completed. It is only when you look back that yoou realise the big differences that have happened. 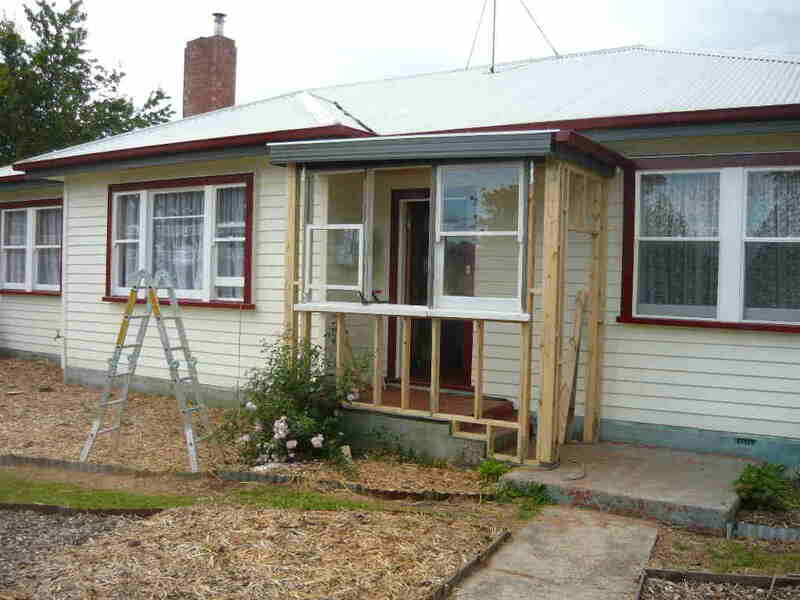 Up to now we have been renovating things. Some of these things such as bedrooms are finished. Now something that we totally removed and built from scratch is finished. 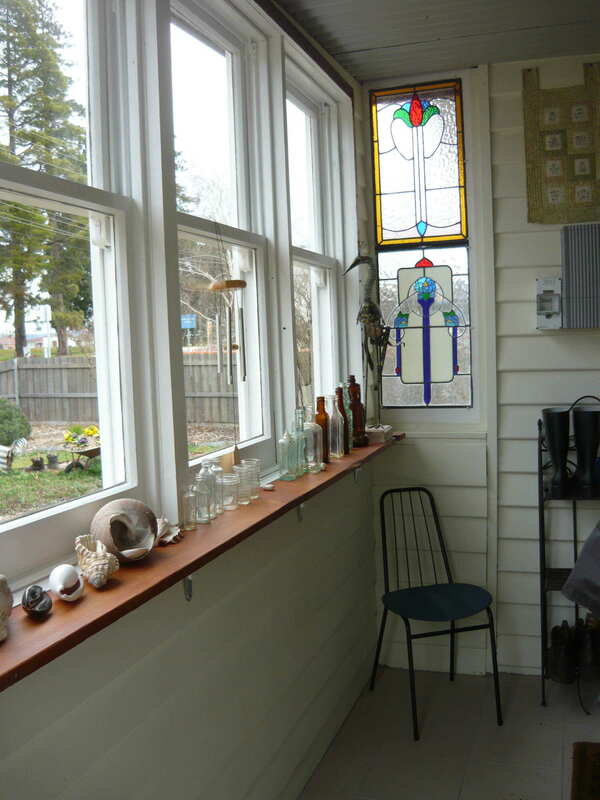 It was ripped down, rebuilt and is now a fully functioning porch with a great front door, somewhere to hang your hat … or coat… and to put your boots as well as a seat to sit on while putting boots on and a great shelf to display stuff on. It is a great example of sustainability also. 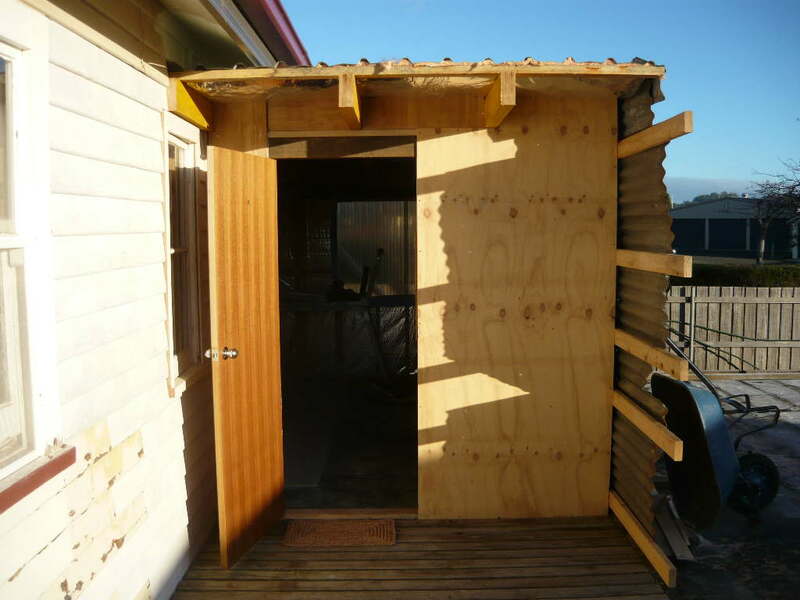 The frame is made from eco -ash, the cladding is all weatherboard taken from other parts of the house and garage and stripped of paint and reused. 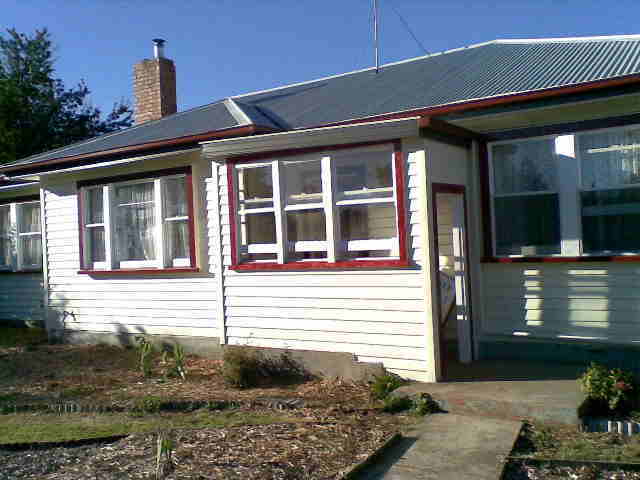 The ceiling lining is roof off cits of colorbond, the windows were bought at the tip shop, the door was the cheapest wreck of a door that I could find at the salvage yard and the tiles on the floor were a remnant lot at the tile shop. As the weather gets colder and wetter so I look for more indoor work. 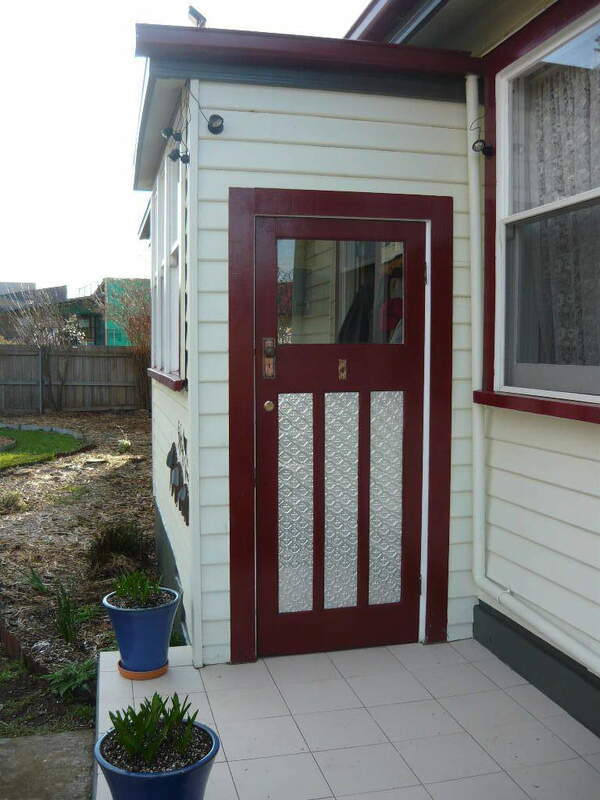 This week I removed the front door, boarded up the hole and got to work rebuilding the front door. 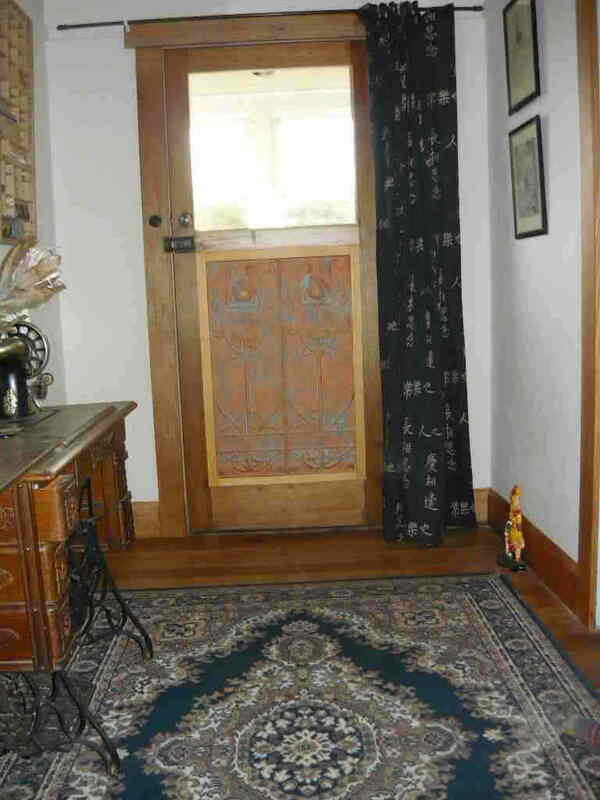 Original door was Tassie oak framed with four panels of dimply horrible glass painted baby blue on one side and puce on the other. I took all the glass out, stripped off the paint, sanded, sanded and inserted a new cross piece of Tassie oak across where the lock is situated. 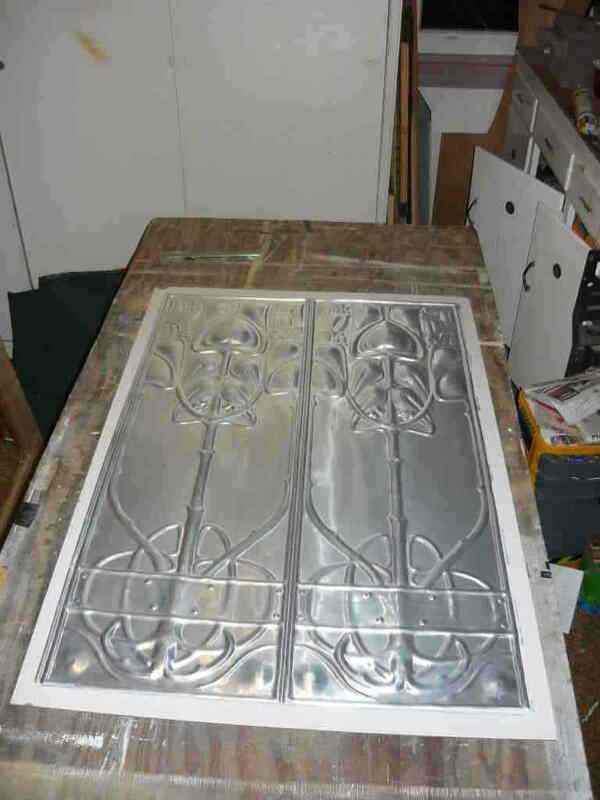 After looking around for something to put in the lower part of the door we settled on a pressed tin panel which we bought from Reliquaire in LaTrobe who supply lots of restoration supplies. 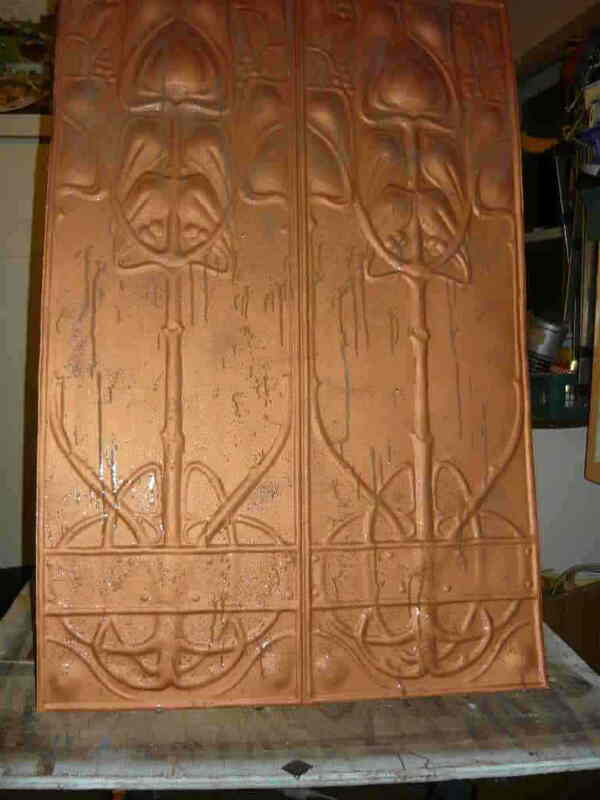 Copper paint was applied on the inside panel. 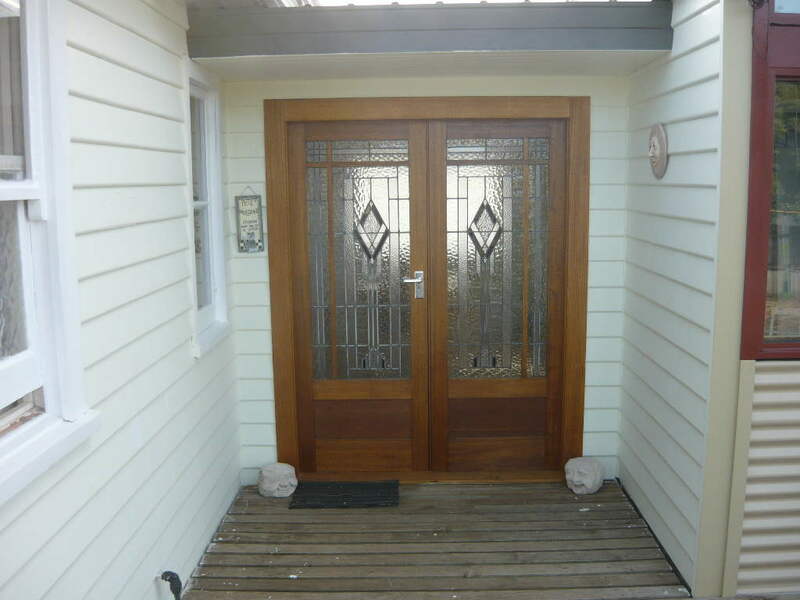 Then the panel was inserted into the door and a huon pine surround was added on the inside and a hardwood surround made from fence palings put through the thicknesser. 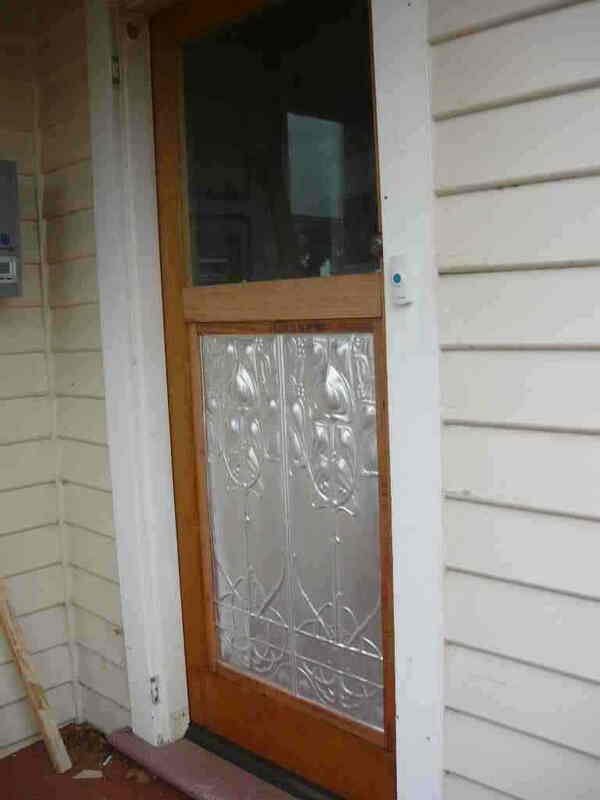 Lastly a panel of safety glass was inserted into the top of the door and the whole thing put back where it belongs.